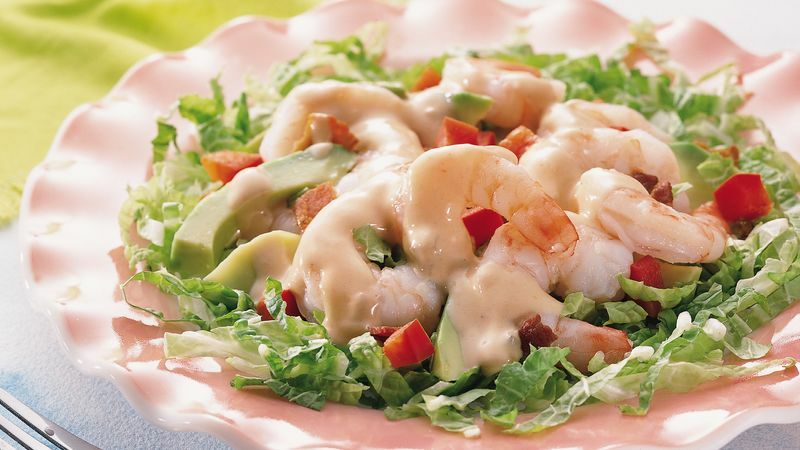 On large serving platter, arrange cabbage, shrimp, bacon, bell pepper and avocado. Drizzle dressing over salad. Cooked shrimp can be purchased at your supermarket's seafood counter. You may also use frozen cooked shrimp that has been thawed. Jars of real bacon pieces are found near the salad dressings at the supermarket. Cut avocado turns brown quickly, so peel and slice the avocado just before assembling this salad. to keep the avocado slices bright green, brush them with a little lemon juice.